A distinctively simple design which suits both modern and traditional settings, whether in a series along a wall or within a porch. As the name of this St. Ives light suggests, this light provides light in both directions. Manufactured using the hot dipped galvanised technique, this St. Ives steel light is extremely robust and weatherproof, including in costal regions, and is also suitable for indoor use. 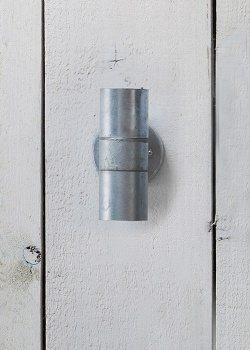 The hot dipped galvanised process creates a unique finish to each light.